Wayne pitcher Kali Brickman delivers a pitch to the plate vs. Butler. 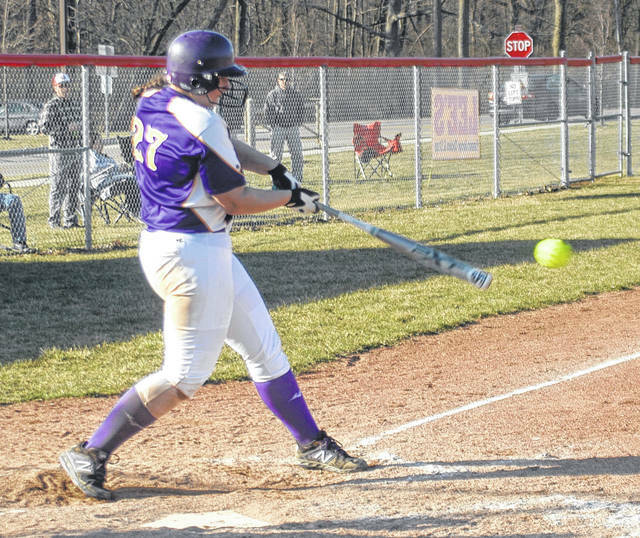 Butler’s Megan Allen hammers a base hit during the Lady Aviators 20-5 victory over Wayne. Wayne second baseman Allie Dodge throws to Katlyn Miller for a putout at first. 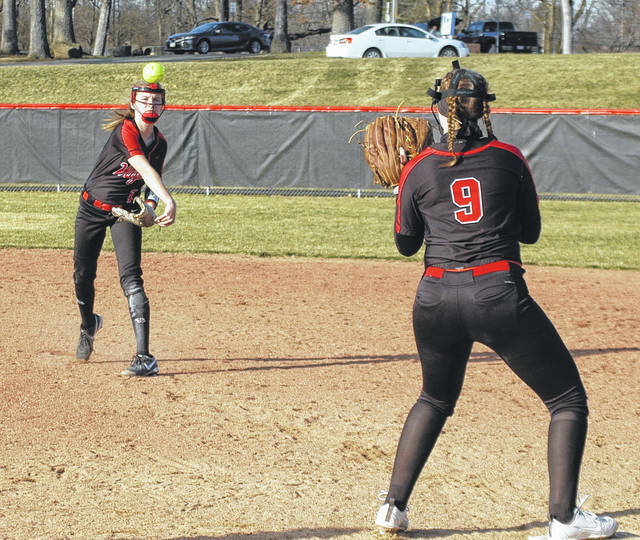 HUBER HEIGHTS — The Butler varsity softball team pounded out 21 hits Wednesday to score a 20-5 run rule victory in five innings over Wayne. 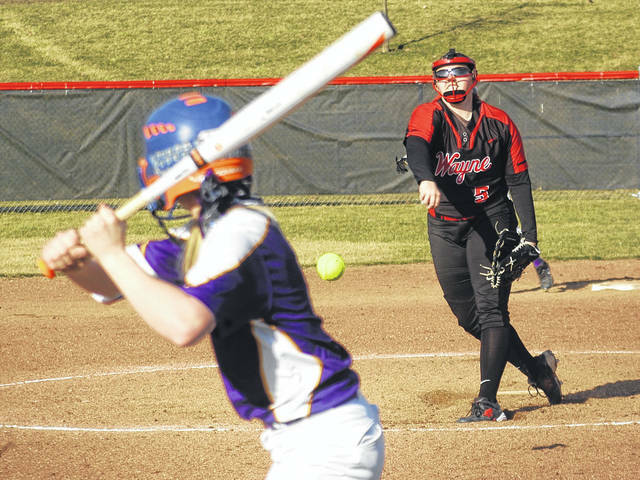 It was a game that saw almost every ball Butler hit find a gap whereas almost every ball Wayne hit went right into the glove of one of the Lady Aviators, which proved frustrating for Wayne coach Joe Viers. Morgan Wright led Butler by going 4 for 4 with a home run, three RBI, one walk and two runs. Megan Allen went 4 for 5 with two RBI and three runs. Amber White went 3 for 5 including a double with one RBI and two runs. Ari Wade went 2 for 3 with one RBI, a walk and scored twice. Nikita Brown went 2 for 4 with a triple, one RBI, a walk and three runs. Olivea Pottorf went 2 for 4 with one RBI, a walk and three runs. Sydney Theobald went 2 for 5 with a triple, six RBI and three runs. Abby Bardonaro went 1 for 3 hitting a double with two RBI and one run. Riley Truesdale went 1 for 5. Theobald picked up the victory on the mound. She pitched 5 innings, scattered six hits, had two earned runs, walked two and struck out six. The freshmen players are Abby Bardonaro, Riley Truesdale, Emmalee Marstellar, and Ari Wade. Butler improved to 2-0 overall while Wayne fell to 1-3. On Thursday the Lady Aviators took a 7-3 first inning lead at Fairborn. A six run 6th inning by the Lady Skyhawks tied the game 9-9. Butler scored two runs in the top of the 7th inning to secure an 11-9 victory to improve to 3-0 and 1-0 in conference play while Fairborn lost its first game to fall to 2-1 and 0-1. Wright went 3 for 4 with a home run, two RBI and two runs to lead the Butler attack. Theobald pitched all seven innings, scattered 12 hits, gave up eight earned runs, walked two and struck out six.